The resorts in this region – little known to Irish tourists but very accessible via direct air links to Lyon – offer a much more laid-back style of winter fun. The peaks are still very high and vary between 1,000m and 1,700 and there are more than 3,000km of maintained pistes throughout the region. The so-called Nordic Sports are also far easier to get into quickly than downhill skiing. The learning curve is considerable softer, with cross-country skiing involving essentially “slide-walking” through wonderful snowy landscape mixed with the occasional gentle taste of downhill sliding. In Métabief, for example – a resort covering 9 villages, the ski resort boasts over 200km of Nordic skiing tracks as well as sign-posted “snow shoeing” trails. Removed from the crowds, in the heart of nature and amidst the silence of the snow-covered forests, the whole family will appreciate the achievement that comes with skiing across an environment that is truly unforgettable. At Les Rousses, there are four villages in this Franco-Swiss ski area with over 220km of pistes that link to the neighbouring resorts of Hautes-Combes, Bellefontaine or even into Switzerland. This paradise of pristine white snow in the heart of the Haut-Jura Nature Park is home to some exceptional wildlife. In Monts-Jura, on the site of Vattay-Valserine, skating or alternative skiing takes pride of place. This area offers over 150km of pistes of varying difficulty levels (including downhill skiing), as well as 3 dedicated snow shoeing trails. Don’t miss the unique view of Mont-Blanc- a rare delight. 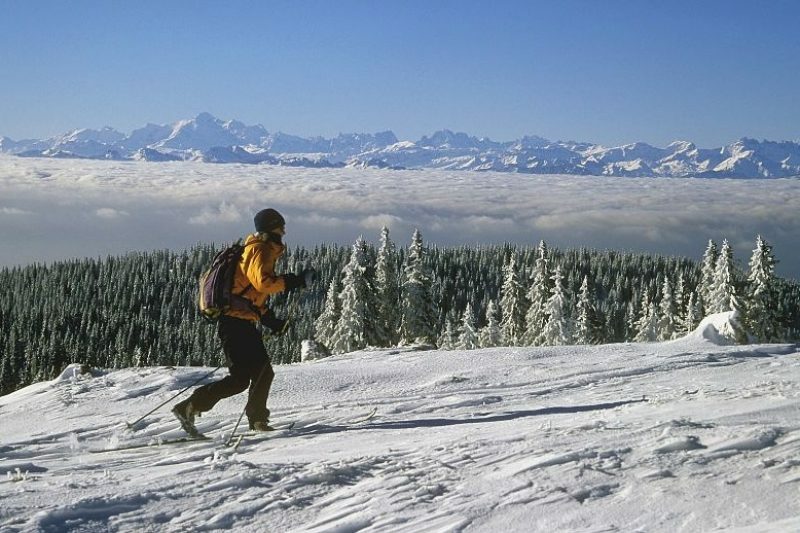 A little further north, Chapelle-des-Bois and its 5 ski areas boast 250km of sign-posted trails and a range of landscapes. Le Val de Mouthe is an Eldorado of Nordic skiing and lovers of skating or classic tracks of all ability levels will find something that suits them. But beyond sport and activities, the Nordic spirit reveals a genuine art de vivre that is perfect for getting in touch with nature and keeping fit. In the Jura Mountains, a welcoming retreat is where your day will invariably end. A recommended adventure is to do a week-long odyssey of 180km on the Grandes Traversées du Jura. This is a 180km long signposted trail that can be tackled in 9 stages. Luggage transfer services available if you don’t fancy too heavy a rucksack on your back. Biathlon is becoming more and more popular. Essentially, it’s cross-country skiing with a gun on one’s back, where you stop every now and again for some target practice. A laser rifle is used rather than a real one so it can be enjoyed by children as young as eight years old in perfect safety. Snow shoeing was practised by fur trappers in times past. Nowadays, snow shoe trails are a gentle way to travel through the pristine and wide open spaces where you very quickly start to feel like an explorer in search of adventure. There are special circuits with loops that vary in length between 4km and 8km. These circuits are available at around ten resorts across the Jura Mountains, where a warm fireplace and fine Comtois meal also await. Aer Lingus operate daily flights from Dublin to Lyon airport. All the resorts are approximately 2 hours’ drive.